Freaky Smudge: The Week of "Designers I Love Displaying the Clothes I can Never Have!" The Week of "Designers I Love Displaying the Clothes I can Never Have!" Also known as Fashion Week! Yes I have been glued to my computer screen and TV for the majority of the day (Praise FashionTV!) because of all the lovely clothes :) I have to say I really do hate it when models have, as Elvis Duran called it, BRF or Bitchy Resting Face. I want to see a model who's happy to be there! I think the models and the clothes stand out more, and it's just nice to see a smile! I'm going to stick up this pic from the Opening Ceremony's line. Look at her (above right)! She's happy :) and that's why I love this pic, and also this outfit. Lovely stuff from the Opening Ceremony; Reds, blues and blacks at this show, escorted by eye catching patterns! It's like when you catch that spirally metal in the sunlight, or some freaky 70's thing! 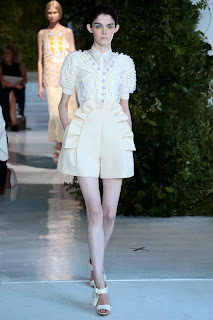 (Left) Milan based, Delpozo, is definitely turning my head :) The collection reminded me of an "Alice in Wonderland" sort of theme. Some outfits, in my opinion, icing-like. Other pieces were more bold, playful colours. Floral patterns spotted. Would keep an eye out for this one! 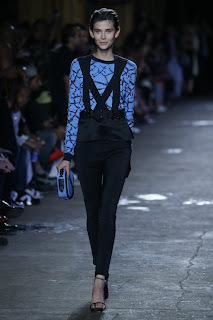 I was loving the collection from Prabal Gurung. (Right) Loads of colours and all up for the bright lipstick, always a big fan! Patterns are really something else, and I would love to know where they purchased the class sunglasses :) Make sure to check out the collection - so far my favourite stuff! Hey, please wish me well on my first official day at college tomorrow :) will report back with all the dets! Make sure to like Freaky Smudge on Facebook and Twitter!